CELEBRATE 58 YEARS OF THE CUBAN REVOLUTION! DJ 100FUEGOS Spinning favourites from Cuba, Latin America & around the world! DJ CARLITOS TUNES TUNES from El Salvador, spinning the hits for you to dance and enjoy! JOOSE JUSTIS Back from Toronto & bringing socially conscious hip hop to the stage! MARIA MELENDEZ Latin-American classics from a multi-talented musician with an amazing voice! MX KATRACHO Singing live Ranchera music from the soul of ‘Nuestra America’! FOOD Delicious Cuban, Salvadoran and Middle Eastern cuisine! DRINKS Famous Cuban drinks- Mojitos, Cuba Libresand more! RAFFLE Win prizes and take home a reminder of your favorite New Year's Eve! SALSA DANCE LESSON A chance to practice your moves for the dance floor! 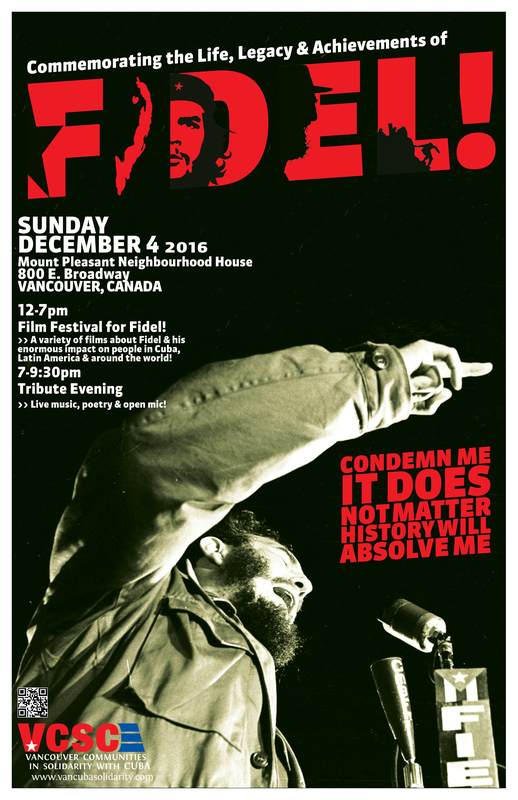 12 – 6:45 pm Film Festival for Fidel! There will be snacks and refreshments available throughout the day. The full program for the film festival is below. The film festival is a free event. All films have English subtitles. *** At the end of the Films everyone will be invited to join us in the main hall of the Mount Pleasant Neighbourhood House for our Tribute Event 7:00 - 9:30 pm. ZUMBA FUNDRAISER 4 CUBA HURRICANE RELIEF! $20 per lesson OR $60 for ALL 4 lessons! Children 13 & under are free! On October 4, 2016 Hurricane Matthew hit Eastern Cuba with devastating force. Thousands of homes and public institutions were destroyed. At the same time, because of Cuba’s excellent government and community preparation, not a single life was lost. However, Cuba now faces huge challenges for rebuilding after Hurricane Matthew which is made worse by the ongoing U.S. blockade against the island. Haiti was also hit by Hurricane Matthew with a similarly devastating force and tragically over one thousand Haitians lost their lives. In response, Cuba’s revolutionary government sent 40 new doctors and emergency medical personnel to reinforce the 600 Cuban doctors and other health professionals already stationed in Haiti before the hurricane. From here in Vancouver, it is time for us to do our part! Come out for a fun and dynamic Zumba class (for people of all ages and abilities) and help contribute to the fundraising campaign for Hurricane relief for Cuba and the Cuban doctors in Haiti. All funds raised to go to the Hurricane relief funds for reconstruction in Cuba after Hurricane Matthew, and to support the Cuban doctors’ mission in Haiti. Interested in what Zumba is? Check out this video. Vancouver Celebrates Cuba’s July 26 Movement & Gains of the Cuban Revolution! Vancouver Monthly Picket Against the U.S. Blockade on Cuba! LET'S BREAK THE U.S. BLOCKADE ON CUBA! End the U.S. Blockade on Cuba NOW! GERARDO HERNÁNDEZ SPEAKS IN VANCOUVER! Join the Che Guevara Volunteer Work Brigade to Cuba! Cuba Solidarity Cultural Night & Film Showing!